I can't imagine anything more warming. Yes, this does seem a bit out of season, but so does rain in the Bay Area in late June. 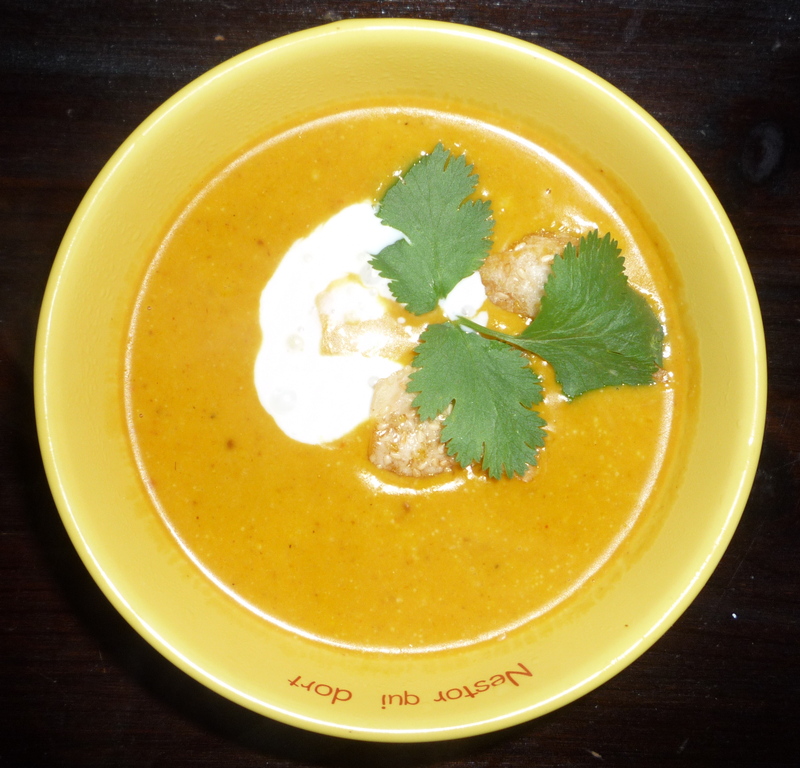 I happened to have some roasted kabocha squash in the freezer, and I always have Thai red curry paste on hand, so I quick soup was just what I needed at the end of a long, rainy day. It is based of a true Thai dish, pumpkin red curry usually made with a kabocha-like squash and pork. This recipe is, in concept, that, thinned and blended smooth. Cook the shallots in soup pot until they begin to caramelize. I used coconut oil, but any oil will suffice. Add curry paste and stir. I like things fairly spicy so I used more than 2 T, but 1 T will provide noticeable, but pleasant spice. When paste starts to become fragrant add some of the coconut cream from the top of the (unshaken) coconut milk can. For a true curry, I’d crack the cream (as described in the last paragraph here), but since this is a quick soup, cooking the paste in coconut oil then adding some of the coconut solids will have to suffice. After a couple minutes add the rest of the coconut milk and the pumpkin. If you had frozen pumpkin, like me, lid and cook until pumpkin is completely defrosted, otherwise cook for a couple minutes to bring pumpkin up to temperature. Add fish sauce, lime or tamarind, and 1 cup of broth. Blend with a stick blender and taste for saltiness, hotness, sweetness, sourness, and texture. If the texture is too thick add chicken broth and reblend until texture is slightly more liquid than desired. Balance with lime, sugar, fish sauce, or additional curry paste after dilution, then cook and additional 5-10 minutes. Serve with lime wedges and fresh herbs.